Following on directly from the end of the previous episode which ended with Buffy and Riley in her dorm room now knowing the truth about each other, that he is part of “The Initiative” and that she is the Slayer. Of course it soon become clear that neither one knows about the existence of the other despite the fact that they are both fighting the same war against the forces of darkness. However despite the couple more than happy to continue with their relationship despite the fact that neither is quite the normal college student that they first seemed, its a peace that is short lived as the campus is hit with an earthquake sending Buffy into a panic seeing how the last earthquake to hit Sunnydale prophecised her death in the season one finale. Now fearing that it could mean the same for her again amidst warning of a forthcoming apocalypse she launches an investigation soon discovering a trio of demons with plans to try and open the Hellmouth. Despite the looming threat of an impending Armageddon being unleashed on Sunnydale this episode is surprisingly more about character development than any kind of big action set piece which I think would be more disappointing had this episode not been responsible for creating some big changes to the current state of the Buffy-verse. While Buffy Riley might be surprisingly willing to talk about the supposedly secret government agency he works for, its really just an overview of their approach that we get here rather than anything regarding their deeper workings or even confirming their base is under the college campus. The Initiative its revealed viewing demons, vampires and the other monsters as just another threat to be dealt with while more amusingly thinking that “The Slayer” was just a boogyman story that monsters told their kids to get them to behave and not an actual person much less that it could be Buffy as she expresses her dismay at Riley’s lack of recognition of her role as the “The Chosen One”. Elsewhere the Buffy-verse’s version of “The Odd Couple” that is Xander and Spike still living together in Xander’s basement where things are only continuing to get worse, especially for Spike who continues his downward spiral caused by his implanted chip which stops him attacking humans and essentially leaving him as he views it impotent. 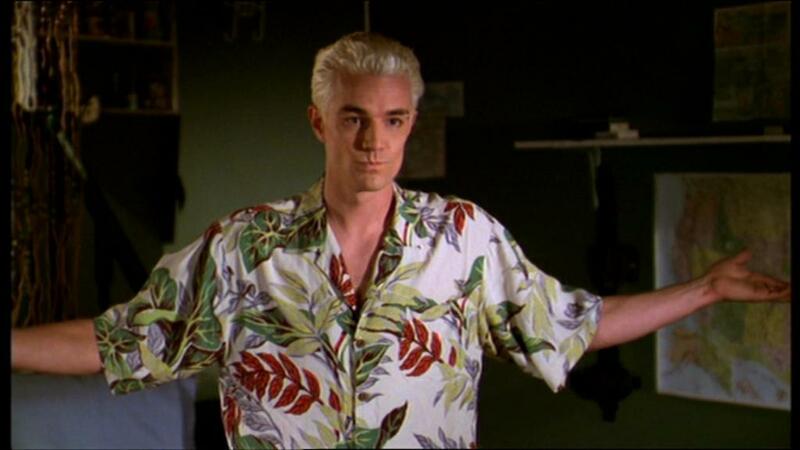 Meanwhile his trademark outfit suffers a washing malfunction when he accidentally shrinks them and leaving him with no option but to raid Xander’s wardrobe so that he spends most of the episode in a distinctly Hawaiian look which is only made the more comical with Spike looking as what I can only assume Billy Idol does on his vacation. Spending most of the episode trying to push Xander into staking him, its a real a real switch in power that we see he and it really couldn’t come at better time that Spike finally finds a purpose and perhaps a sense of redemption when he discovers that his chip only prevents him from hurting humans and not other demons which he discovers during the final showdown in the charred ruins of the Sunnydale High library. Its a great way to switch Spike from foe to Ally without nailing on some cliché reason / cause (see True Blood) while perfectly suiting his character who is always to be expected to side with whoever is in line with his cause which in this episode we see switching from killing Buffy and the Scoobies to well killing demons instead. 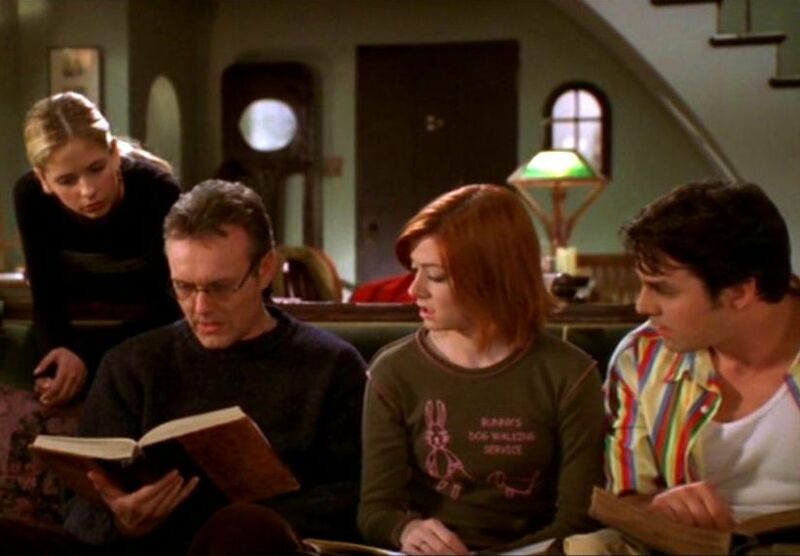 The showdown in the Sunnydale High Library is a fun throwback to this location and its amusing to see little touches such as a charred chunk of the former Mayor’s demon form, while the more sharp eyed will also notice things such as the remains of the book cage or the sports trophy which imprisons Amy’s witch mother (from way back in the second episode) lying on the corridor floor.